Project Project: Project Baby: Guess the Gender Giveaway! We will find out the gender of our baby this coming Wednesday night, so to celebrate I'm having Project Project's first ever giveaway! Naturally, you all want to know what you can win. Naturally, I want to tell you: One lucky winner will get to pick the prize of their choice from the following selection, soon to be lovingly hand-knitted by me. 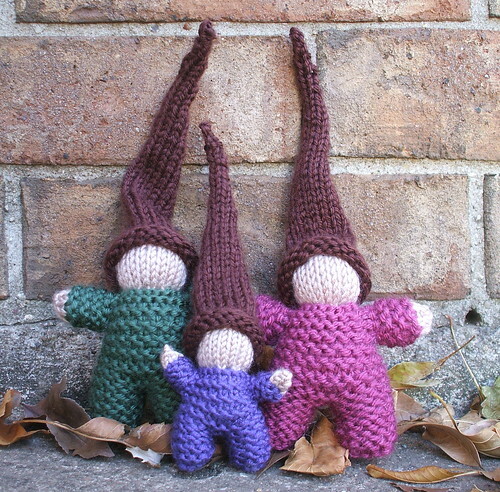 As this is a baby-themed giveaway, what prize could be more appropriate than your very own hand-knitted baby? Or, should you be more scientifically minded, I will knit you a uterus, complete with ovaries and fallopian tubes! A womb of one's own! Not too enthused about the whole baby thing? Don't need a uterus just yet? Then option 3 is the one for you: your own little monster to take home and love! The competition is a short one, and will close at 6:30 P.M. MST on Wednesday, October 7th( that's 2:30 AM on Thursday morning for you Norwegians). That is the time of our doctor's appointment, and I very seriously doubt we will be keeping things quiet for much longer than that. Enter the competition by leaving a comment on this post, specifying 1) if we are having a boy or a girl (those are your only options) and 2), which prize you would like. Don't forget to tell me who you are, if it's not already obvious. Once we know the gender, I will take everyone who guessed correctly and drop their names in an old-fashioned, impartial hat. Then a mostly unbiased judge (Nick) will pick the winner! The winner will be announced with much pomp and circumstance, along with the gender of the baby, on Thursday, October 8th. At this point I will begin making the chosen prize, and the winner will just have to wait patiently (with much pomp and circumstance!) for me to finish and present it to them. Hmmm boys are more likely in the North family...and Im not sure there is a favored gender from the Robole genes...soooo I choose GIRL! Just because she would be so gosh darn CUTE! heheheh (and everyone else chose boy)....That monster is looking rather lonely...he should join the ones on my bed! LOVE TESS! I think boy. I like the nitted baby. Boy! I love the uterus but I really, really love the blue alien! I guess a girl and I love, love, love that cute blue alien! Yay for contests and babies! I vote boy. A small, Northy-Roboley looking boy :). My name is Trish. You want to pick me. Sorry to skew the numbers - I would like an alien, please :). Although the uterus is a close second. I think it's a boy but only because I found the most perfectest gift EVER for baby-of-Tamsin-and-Nick if it's a boy. And my goodness - a hand-knitted uterus. You are awesome. But I would choose a baby because those gnome hats are DELICIOUS! It's a girl, and I want the knitted cup-cake you're keeping under wraps. Your mummy. I vote boy! May your first child be a masculine child! 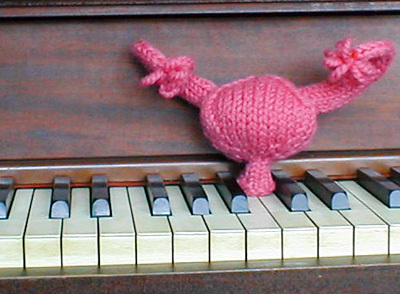 I would LOVE to own a hand knit uterus! hahahahhaha I love that you made that... you are my hero! Ditto what Caren said, with slight spelling modifications. Let's say it's going to be a boy....but just in case I'm wrong, let's go with a girl. Okay, I really choose boy. I already have a uterus, so I suppose I'll go with the little monster. We'll have to hang out again soon. Girl, obviously. Monster. And I'm excited to hear your results, although I'm also convinced of my choice. Im gonna have to go with girl! I feel it! hahaha! And I love the lil monster alien thiny! He's so cute! And I like Tess have a monster collection!